Maria brings a 25-year track record delivering profitable film, TV, games and digital media products and services to broadcast, media and telcos. She advises start-ups, established companies, consortiums and government. Maria provides independent, informed, expert advice to address your company’s needs. Here are some examples – with testimonials. Need to build or rebuild a VOD or OTT service? Want trusted expertise from someone who’s done it and can help reduce the risk of mistakes, excessive costs or extensive timescales? Maria has delivered end-to-end VOD and OTT services from both a supplier and retailer perspective for premium-level security content from all the major studios and large independents. She also understands idiosyncrasies in emerging markets like South Africa and on small islands. Watch her Keynote from the Video Infrastructure Summit. Need to reduce costs of an existing VOD or OTT service while increasing quality and capacity? Audits your entire infrastructure and reports on ways to improve its service. Maria was the first person in the UK to build a premium VOD film service for under £1M when other services like Kangaroo cost £40M, Arqiva bought the kit for £8M and YouView cost £110M. She also saved FilmFlex about £500K per annum on its previous build and did this with a company size of fewer than 15 people. Her high attention to detail as well as the big picture ensures quality – attested to in her testimonials. Need technical security approval on content licensing from the studios? Maria has trusted relationships with the major studios in the USA and UK. She has successfully negotiated contracts with Disney, Fox, Paramount, Sony, Warner and NBC Universal. These contracts formed the basis for agreed licence deals with all the other content providers. 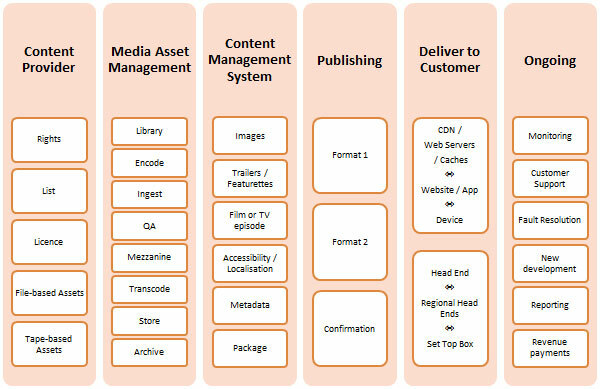 Read Maria’s article on Content Security Essentials for Studio-Level Video on Demand. Need independent strategic and technical due diligence on your new or proposed video service, product or start-up? Maria has run independent audits, technical reviews and risk analysis on existing and proposed solutions. She usually tears apart start-up business cases in 5 minutes and can prevent investment in weak propositions. She can advise on where the weaknesses are and can help start-ups create a viable proposition. Need a trusted independent expert advisor / NED with international experience? Contact Maria to discuss what you need.